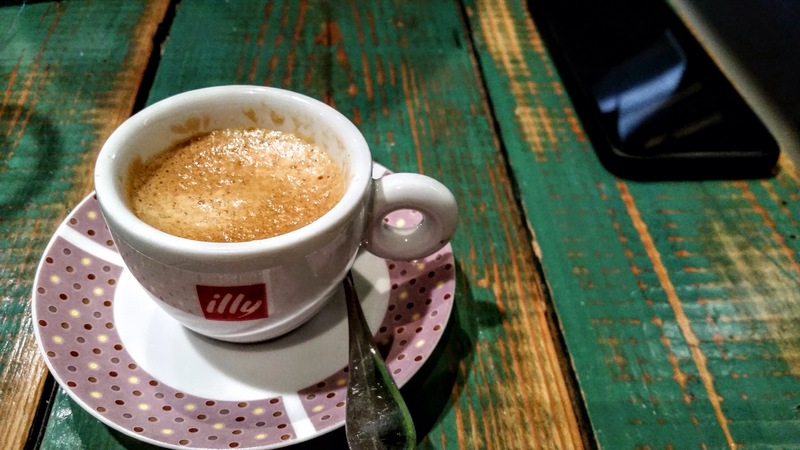 This is my writing challenge 3 of 17: writing a post a day until I leave for vacation on the 21st. Let me begin by telling you that this was a decadent and sinful enjoyment. 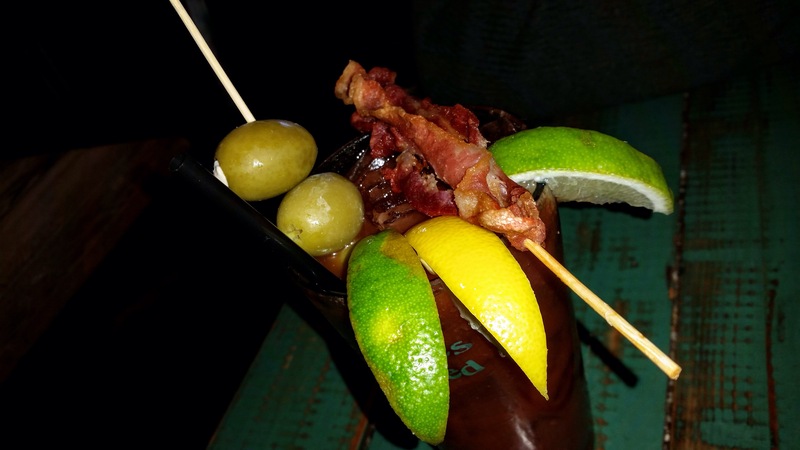 It was a survey of the Mill Street Bar & Table’s best, i.e., seafood. I went with someone who knew the restaurant well and was lucky enough to benefit from his prior experiences. Thank you, Mustafa Mansour. I am very tempted to let the photos and the descriptions of the dish stand by themselves on this post, especially the oysters. Oysters are a slice of heaven, reminding me of what could be and what I should strive for. We had them three ways: raw, fried, and grilled. ICED OYSTERS ON THE HALF SHELL:Mignonette, Cocktail Sauce, Lemon Stella Mar, Greenwich, CT • Island Creek, Duxbury, MA • Basket Island, Casco Bay, ME • Lucky Limes, PEI, New Brunswick, CAN • Tisbury Pond, Martha’s Vineyard. This by far is the best way to eat the oysters. 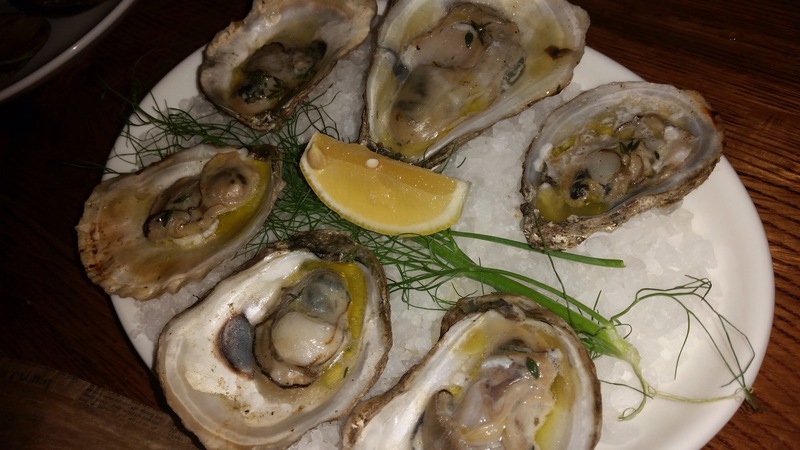 You get to enjoy the rawness of the oysters, experiencing the salinity, the cleanliness, and the texture of the oysters. I love the way the oyster go down when you slurp it up. The smooth and the slimy. 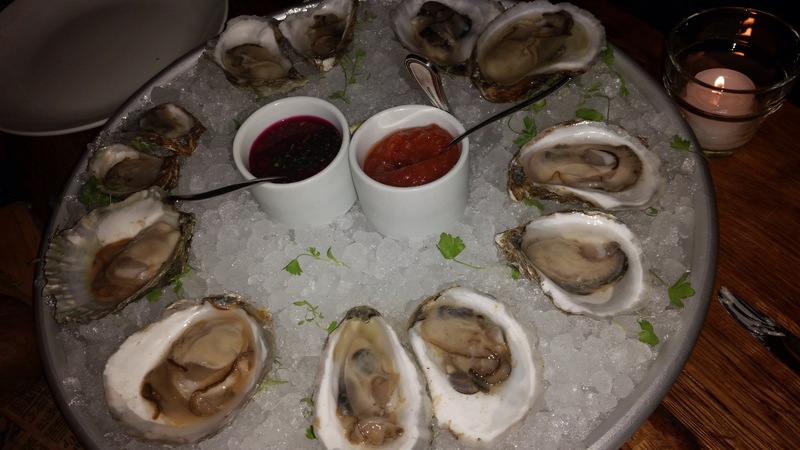 Yes, there was also a discussion on how oysters are being farmed in the east coast of the US. FRIED STELLA MAR OYSTERS: Kimchi Mayo, Lemon. The fried oysters here surprised me. They were much better than expected. The batter was thin and tasty. The whole ensemble was excellent. GRILLED STELLA MAR OYSTERS: White Wine, Butter, Thyme. This was good but in comparison to the raw and the fried, it would be my third favorite way to eat the oysters. BAKED CLAMS Spicy Peppers, Butter. Baked clams are more superior than the grilled oysters since they are more meaty and you can retain more of the sea when baked. 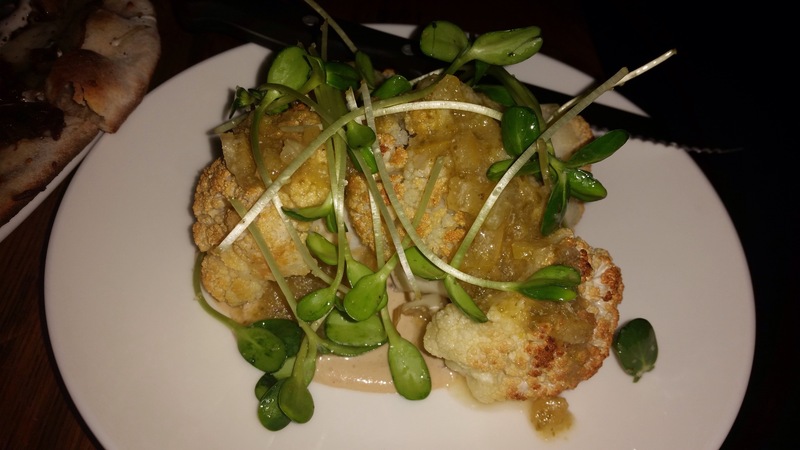 ROASTED CAULIFLOWER: Pine Nut Butter, Capers, Lemon. I loved this. I am a fan of cauliflower and roasted foods. The burn with the acidity of the lemon made me very happy. 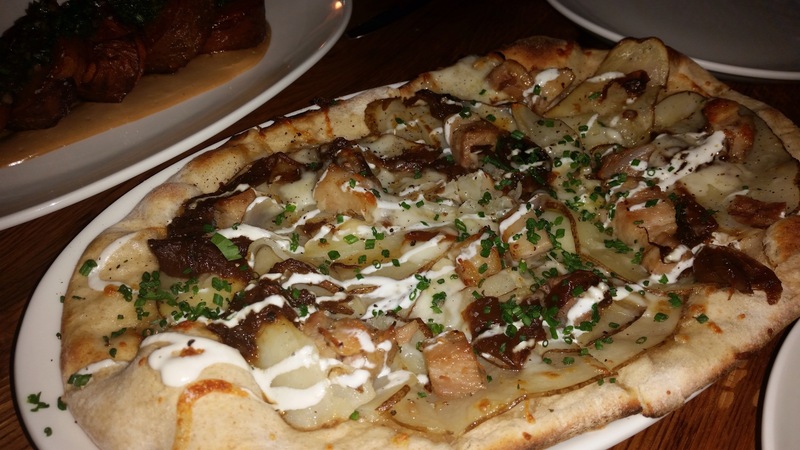 Thin-Crust Flatbread: Potato, Crispy Pork Belly, Caramelized Onions, Crème Fraiche. This sounded like an intriguing proposition – crispy pork belly with Crème Fraiche but it was the worst combination imaginable. The flavors were fighting against each other as was the texture. The potatoes were lame on top of the flatbread. This dish fell very flat and most was left uneaten. 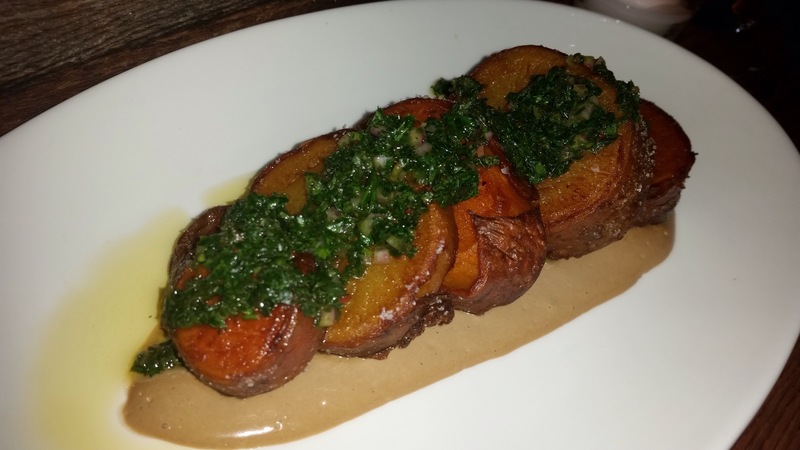 CRISPY SWEET POTATOES: Black Garlic Aioli, Herb Salsa. This came highly recommended and was my friend’s favorite dish at Mill Street. The black garlic aioli apparently makes the dish. Unfortunately, I couldn’t appreciate it at all due to my bias towards sweet potatoes. 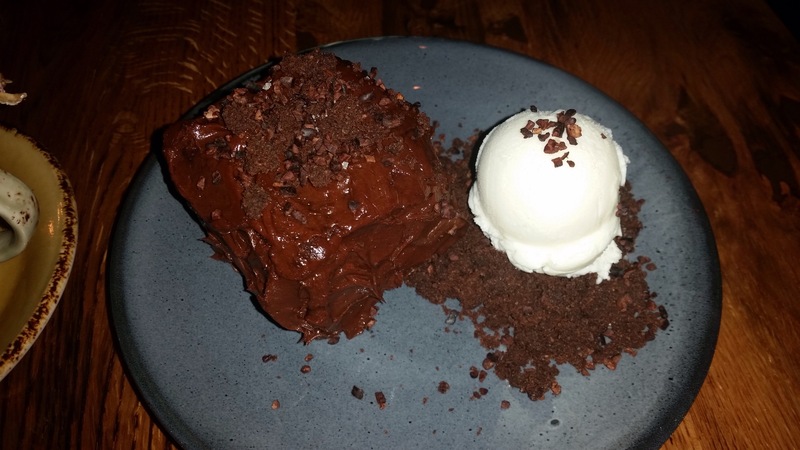 CHOCOLATE CAKE: Cookie Crumb & Milk Ice Cream. This was a complete flap for me. I took two bites. Pedestrian at best. 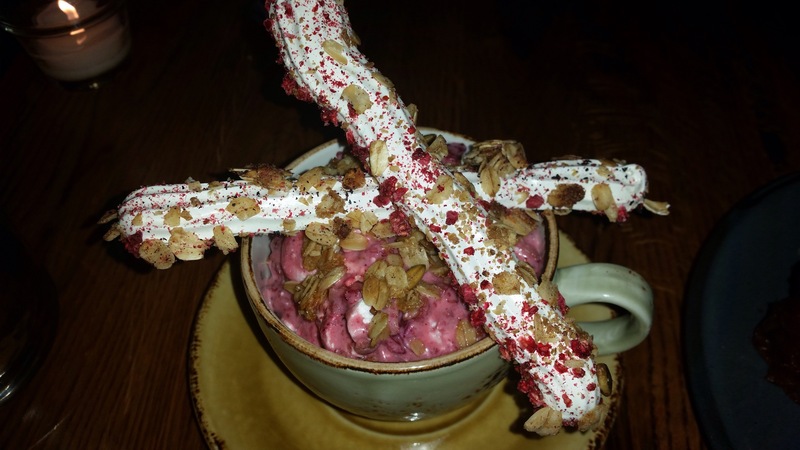 ETON MESS: Passion Cream, Granola, Muddled Berries, Meringue. I didn’t know what Eton Mess was and Mustafa kindly explained it to me. His verbal description painted a picture that the actual dish couldn’t beat unfortunately. The visual of the dessert is beautiful though. 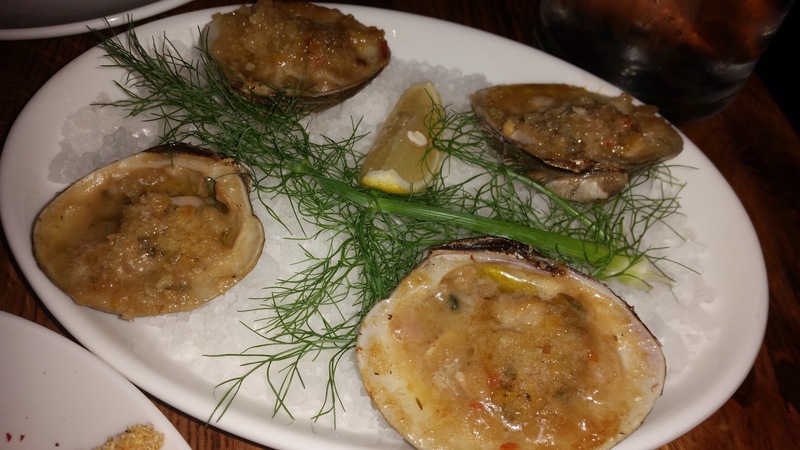 I would say that the Mill Street’s oysters rival with that of the Elm Street Oyster House. Both restaurants are in Greenwich, CT. I would definitely return to both. My experience here was delightful. I went to Centro in Greenwich, CT with a lot of work friends, including agency partners. 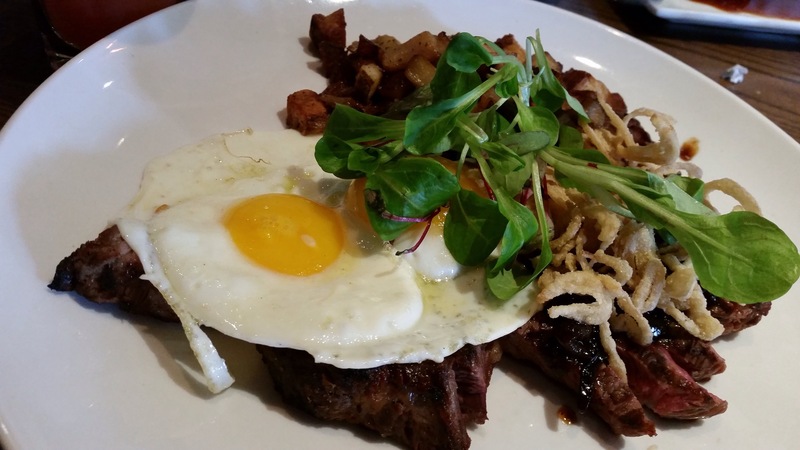 Overall, the food is better than expected and above average. The appetizers, mainly their European thin crust pizza, are so much better than their entrée. So order the pizza when you are there! 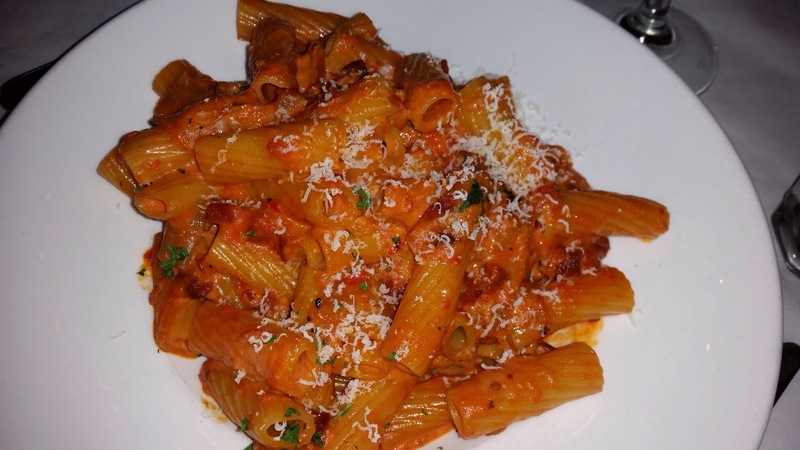 Rigatoni alla Vodka: Prosciutto, peas, tomato cream sauce, crunchy bread crumbs. 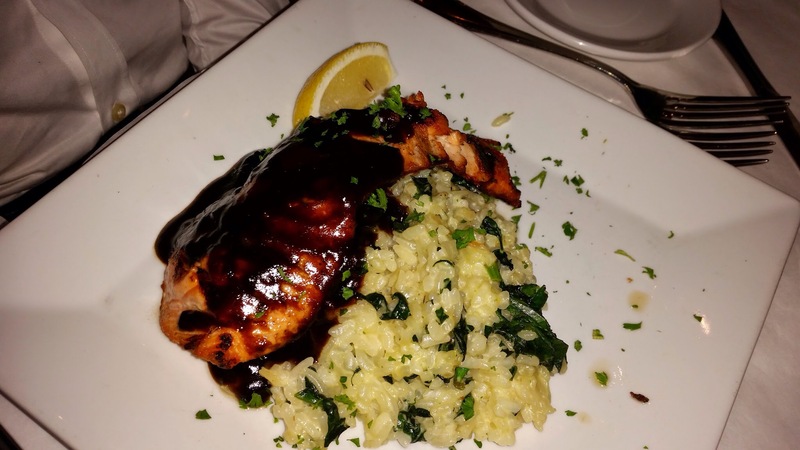 Balsamic Mustard Glazed Salmon: Over spinach risotto. 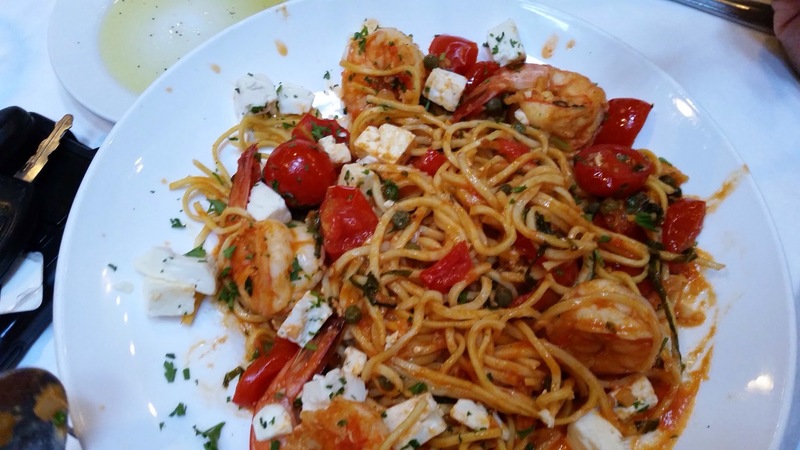 Shrimp Splendido: Sautéed with tomatoes, basil, capers & garlic tossed with homemade spaghetti, topped with crumbled feta cheese. 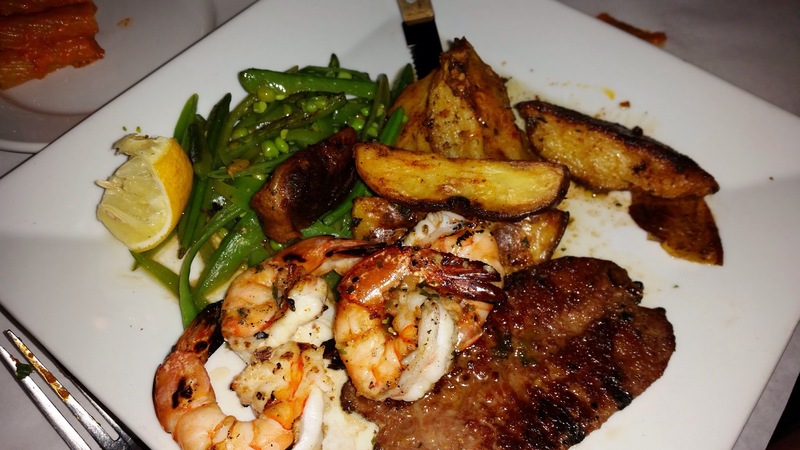 Mixed Grill: Shrimp, chicken, Italian sausage, garlic scallion butter, roasted potatoes. 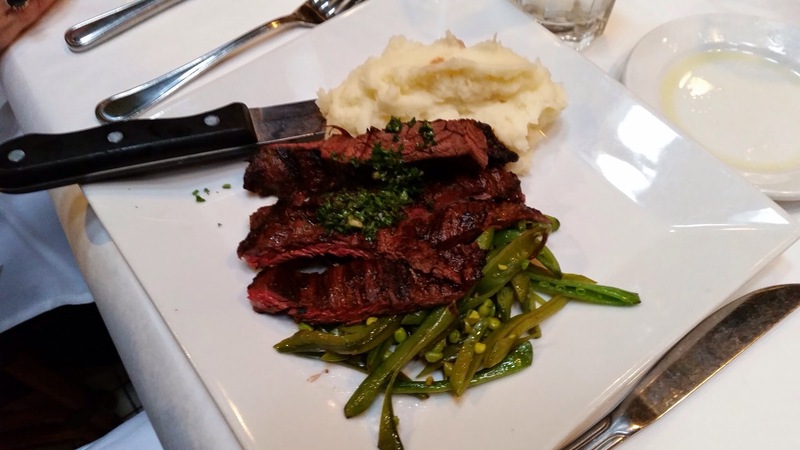 Grilled Skirt Steak: Chimichurri with roasted fennel mashed potatoes. Guess whose dish this is? Too greasy. My original steak was not medium but well done. In fact, they made a mistake in taking our large group order and someone (thank you, Jen!) gave me her “rare” steak that is just the right medium. The restaurant is next to a stream with water flowing down a wall and over rocks. The patio overlooking the water feature was a selling point. The cocktail list was cute. Pizza was good. Should return. For one reason or another, I never had a happy Mother’s Day. This past May, I decided that I was going to plan my own holiday. 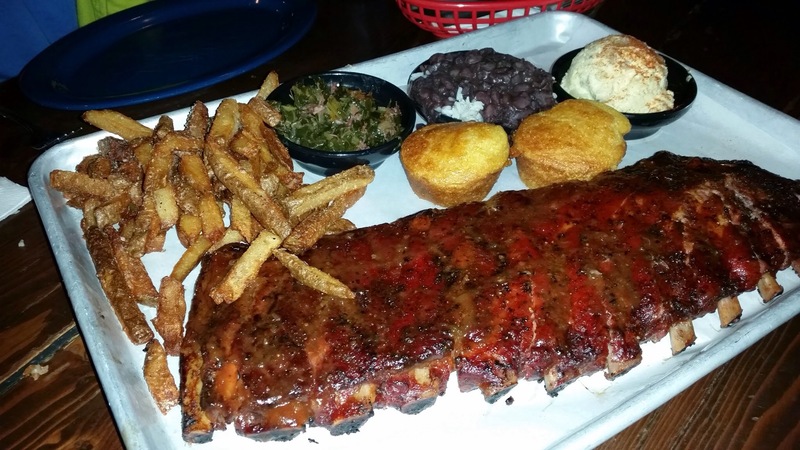 I chose to eat at Dinosaur BBQ in Stamford, CT because I love BBQs… What a disappointment! The food was below par. 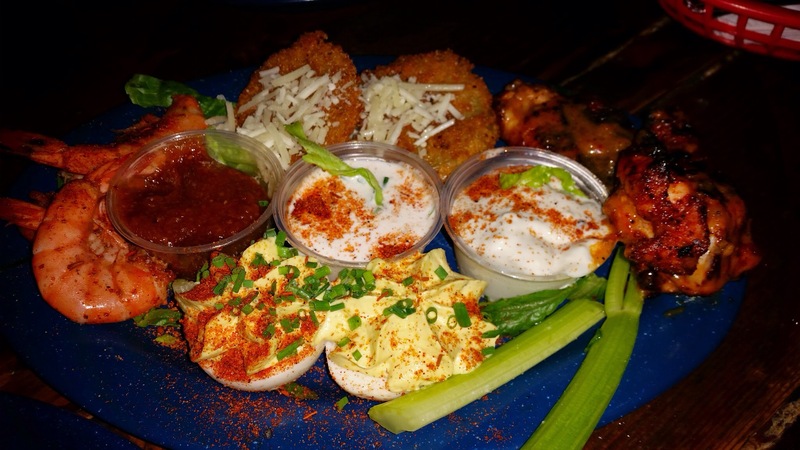 SWAG SAMPLER PLATE: drunken spicy shrimp boil, chicken wings, fried green tomatoes, devil eggs. The shrimps and the chicken wings were average at best. The fried green tomatoes seemed interesting but had too much batter and were over-fried. The devil eggs had too much mayo and tasted disgusting. 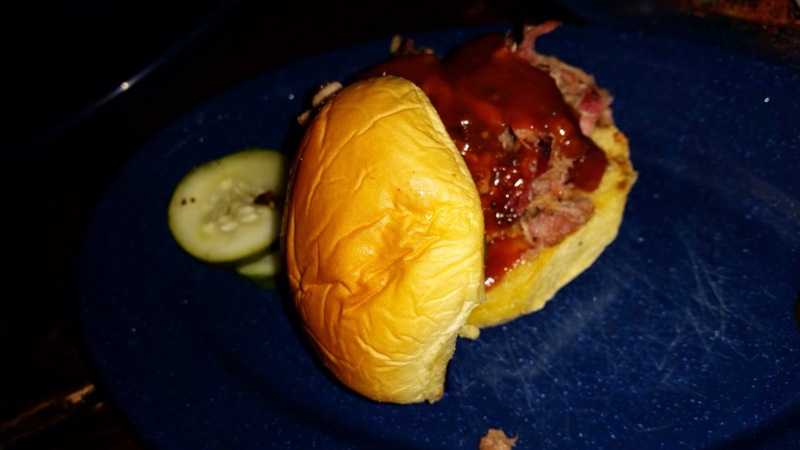 BBQ Sliders: pulled pork with pickle. This was the best dish for the entire meal. The pulled pork was tender and juicy. the pickle was refreshing against the bad appetizers but the bun was average super market grade. Full Rack of BBQ Pork Ribs – St. Louis ribs were dry rubbed and slow pit-smoked, then lightly glazed with their original BBQ Sauce. This was below average because the meat was dry and too fatty. The sauce was tasty but was not enough to offset the dry meat. Side dishes are: turkey neck greens, BBQ beans with pork, Harlem potato salad. Other than the Harlem potato salad, the greens and the beans are a home run, in comparison to the sub par meat. For better southern greens, click here. The moral of the story for Mother’s Day 2015 is to avoid chain restaurants and do a better research job. Oh – the decor of the restaurant was the enjoyable part of the experience. It was BBQ themed. 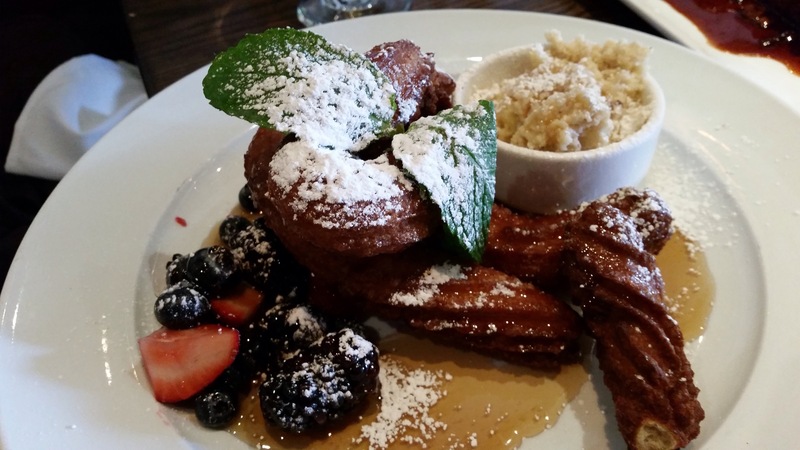 EOS Greek Cusine in Stamford, CT – My New Favorite Cusine. Opa! EOS Greek Cusine on Summer Street in Stamford, CT has a very sophisticated interior and a detailed menu that offers the most common and popular Greek dishes. The restaurant prides itself for being a contemporary Greek restaurant that brings together freshness and simplicity that remind us of the Mediterranean. I was pleasantly surprised that they delivered exactly what they promised. Greek cuisine has never been ranked high on my list but after this dinner, I have found a new favorite. The vegetarian moussaka was the best. So good that I took the leftover home and had it for breakfast at work the next day. I stood in front of my monitors (I was lucky enough to have a standing desk), checked emails and had this Greek lasagna with béchamel cream for breakfast. 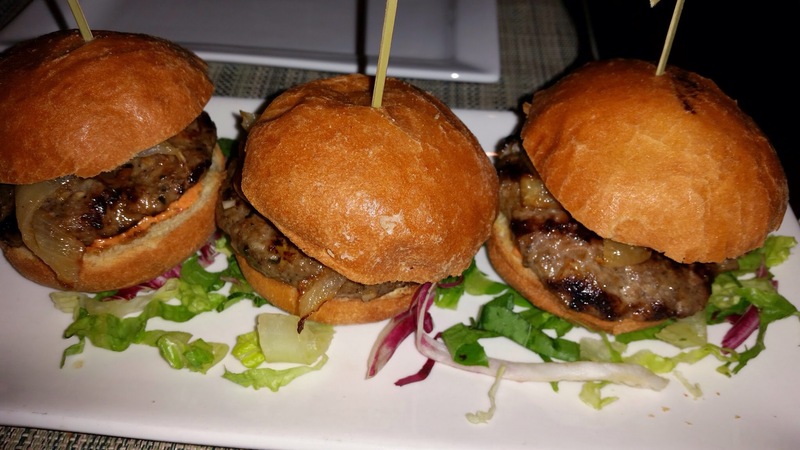 Eos Sliders: 3 spiced lamb sliders with caramelized onions and roasted red pepper sauce. My choice obviously since my friend does not like lamb. The lamb was acceptable but not outstanding because too much oil was used. 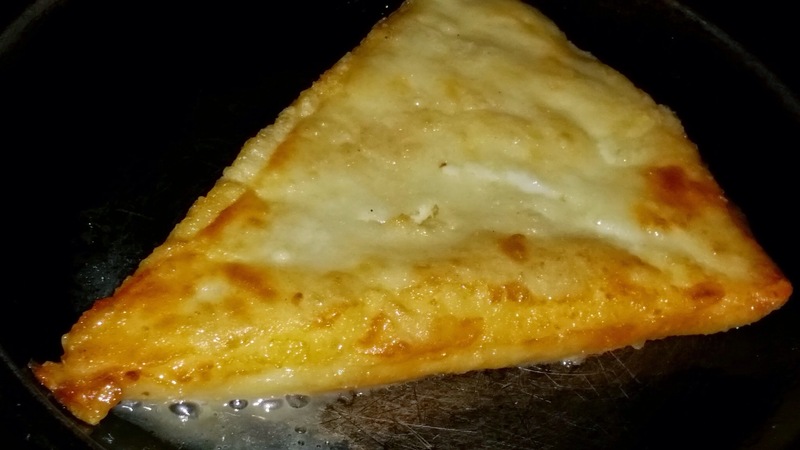 Saganaki: Kefalograviera cheese flambé. Live shot of the flambé. Should have taken a video instead. 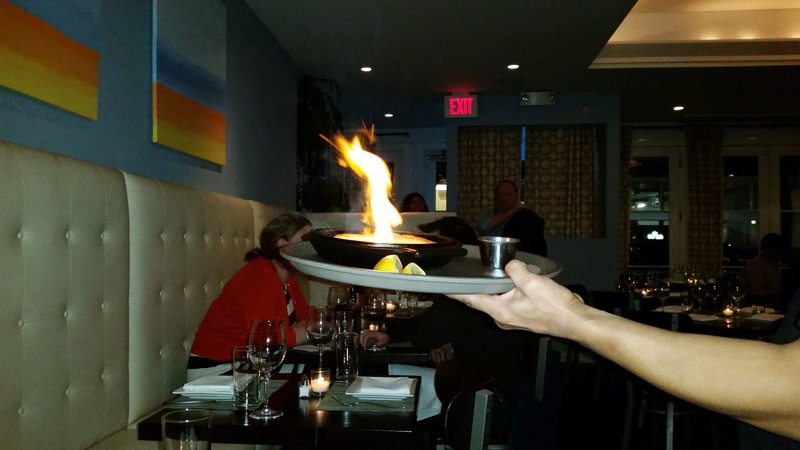 The waiter walked over, lit the cheese on fire and shouted “Opa!” in less than 30 seconds. The flame was put out with a squeeze of lemon juice. Darn, I wish I thought quick enough on my feet. Saganaki: Kefalograviera cheese flambé. This is the after shot. The cheese was still bubbling. It was much better when warm and felt heavy and salty after cooling down. Still, this was quite a food experience. 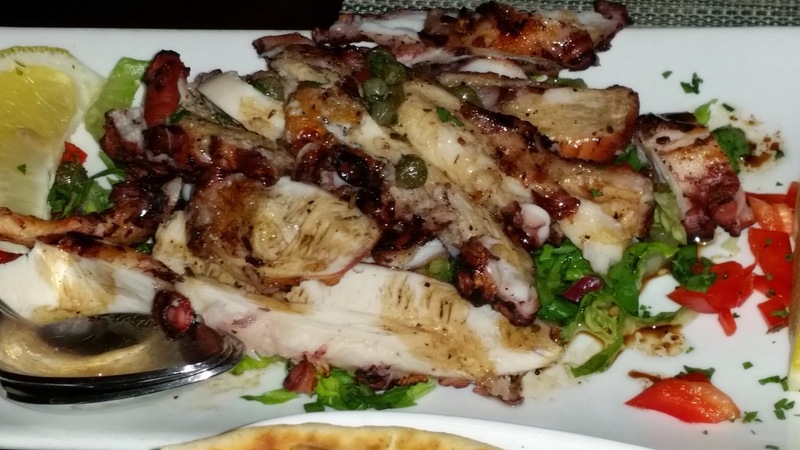 Grilled Octapodi: Grilled octopus with olive oil and balsamic vinegar. Both my friend and I are big fans of octopus. This was a big portion but we enthusiastically ate it all up. The addition of capers was a welcome accent. Always enjoyed grilled octopus with the olive oil and balsamic vinegar combination. 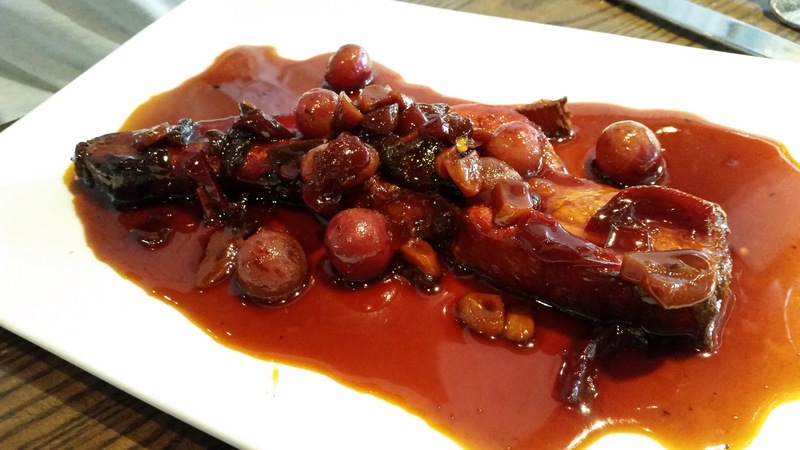 The slight downfall of this dish is that octopus is slightly overcooked before grilling. The consistency can be a little bit more bouncy. Veggie Moussaka: Layers of zucchini, eggplant, mushrooms, lentils, potatoes and béchamel cream. 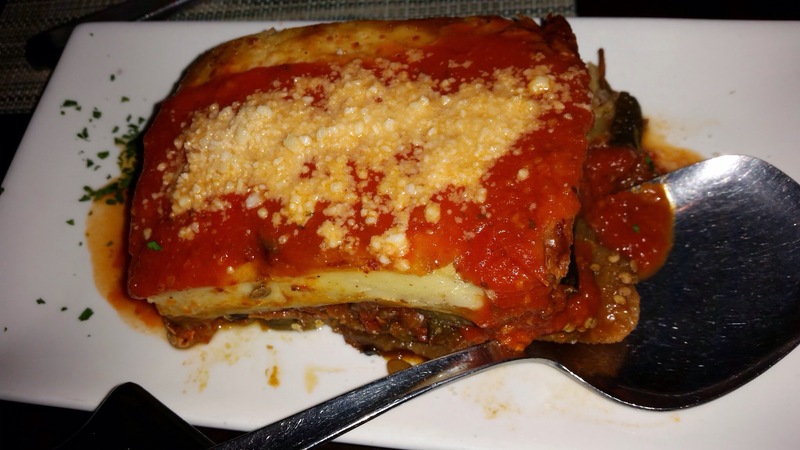 I felt heavenly with this veggie moussaka… Veggie moussaka is the Greek lasagna for me now. It’s more supple than the Italian lasagna pasta layers and is richer with the flavors of vegetables and béchamel. Happy and loving it. Thank you, Danny, for insisting on ordering the vegetarian version. What a fun meal filled with fire, flavors and new openings for me. I learned that preconceived notions can be changed as long as I dine with the right company at the right restaurant. EOS Greek Cusine gets a two thumbs up, one for the food and the other for the eye pleasing interior. Highly recommend it. My senses were completely satisfied. 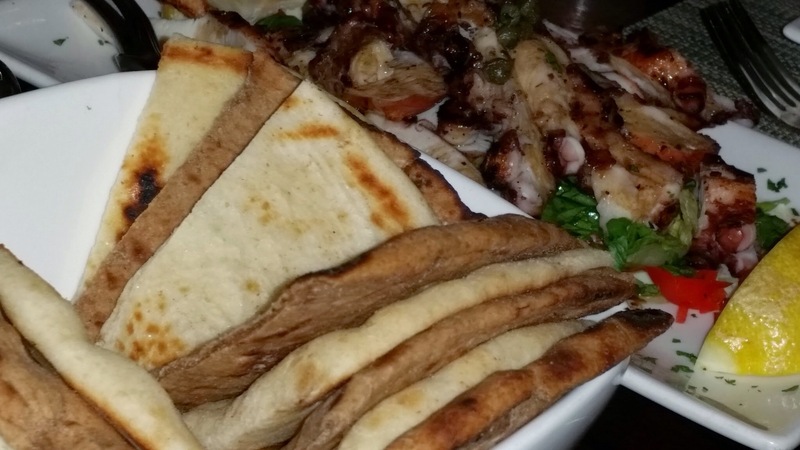 Posted on June 21, 2015 June 21, 2015 Categories Cuisines, Fairfield, Greek, New York Metro, StamfordTags Cheese flambé, EOS Greek Restaurant, Greek Restaurant, Greek Restaurant Stamford CT, grilled octopus, Saganaki, Stamford CT, Veggie moussaka2 Comments on EOS Greek Cusine in Stamford, CT – My New Favorite Cusine. Opa! 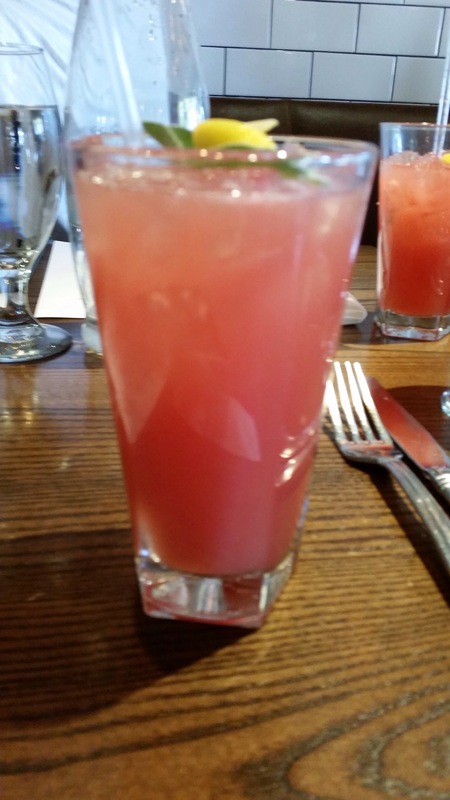 Mama’s Boy in South Norwalk, CT – Happy Mother’s Day! Find Your Own Refuge and Be One for Someone Else. I am a mom of an 11-year-old young girl who is the most important person to me in the world and who grounds me in NY whenever I have a strong desire to simply disappear. The decision to have this child changed the trajectory of my life more than anticipated. Being young and stupid, I had no idea what I was signing up for in the paradigm of a marriage. On this Mother’s Day, I decided to have an awesome Mother’s Day in recognition of giving up a blossoming career and a big part of myself all for the sake of the child and family. The best part: I am now mostly free and planned the day myself to ensure no failures! 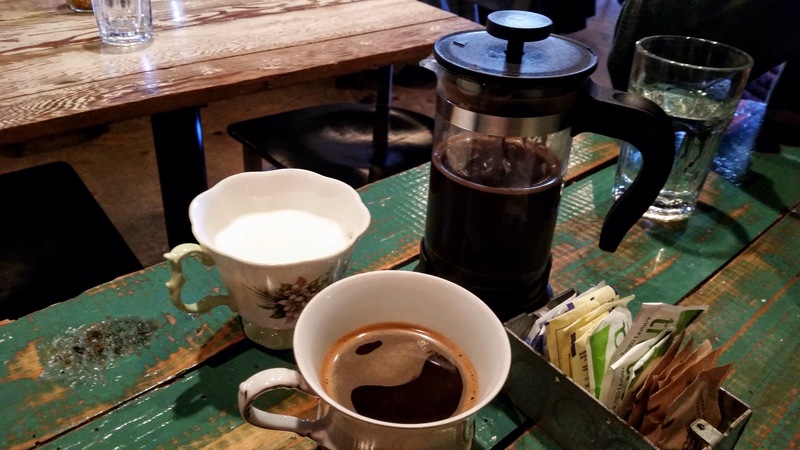 Seems logical to write about Mama’s Boy in South Norwalk, CT in celebration of all mothers. 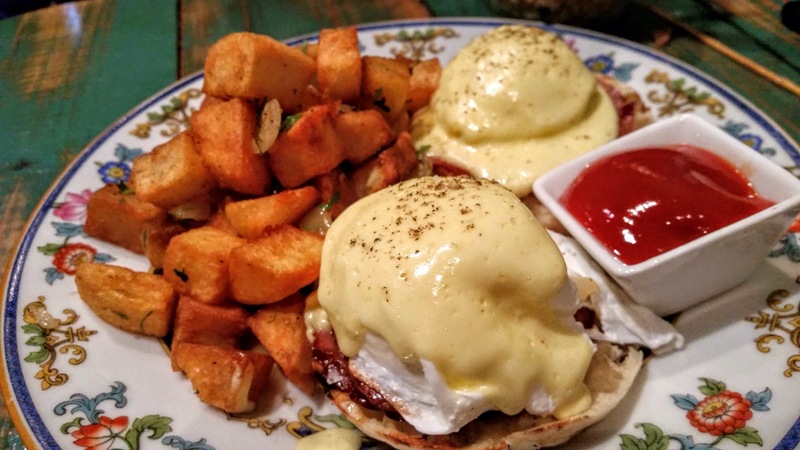 Mama’s Boy in South Norwalk in CT calls themselves “southern table and refuge” because they promote a casual dining experience where you are treated like a family. That’s exactly how I felt when I was there a few weeks ago. A sense of comfort and love. This is the corn muffin with honey butter and chill jelly. The muffins were warm; the butter was as sweet as honey and the jelly was sweetly spicy. These are great combinations of textures – warm and crumbly into gelatinous sweetness with a kick or warm and crumbly into a soft surrounding. Deliciously excellent. Pei Black mussels with lemongrass, blistered cherry tomatoes, lobster saffron sauce, crusty bread. The lobster saffron sauce made it sing. The mussels were very fresh and clean. Definitely repeatable. Collard Greens with house-smoked bacon, cider vinegar, hot sauce. I love collard greens and I make collard greens. I was looking forward to see how this dish really should be coming from a Southern restaurant and not from the stove top of an Asian girl. Alas, it was disappointing. The taste did not soak into the greens and it was salty. This was a failure. I subsequently had better at two other Southern restaurants – posts coming up shortly. “Rissotto” with Anson Mills middlins, dry boat scallops, country ham, spring peas, shallots, white wine, lemon zest. Surprisingly, the risotto from this Southern restaurant was creamy and delicious. The scallops were seared perfectly and the freshness (although they were dried) came through in the texture. It was bouncy. This was the best dish of the night – other than the corn muffins. Shrimp and Grits with white shrimp, Fall’s Mill grits, house-smoked Tasso, spring onion, pimento cream gravy. I was talked into ordering this dish because this is one of their most renowned items. So much high hope and yet it under-delivered. It was too creamy and the shrimps to grits ratio felt off. The shrimps were drowning in the grits and the creamy gravy. It was also too heavy; the dish tried to accomplish a little too much all at once. Felt like an over-eager person that delivered a 65 slides of a Power Point presentation when he only needed about 12. 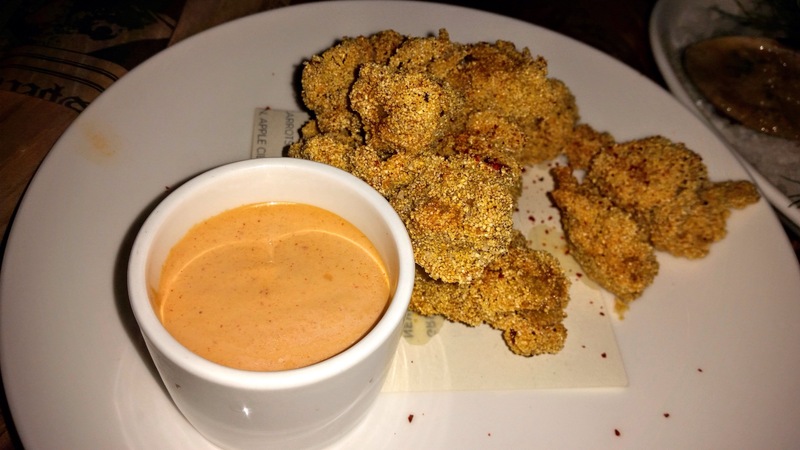 Overall, Mama’s Boy is a great Southern restaurant. The farm to table approach is admirable. The staff is friendly and yet not intrusive. The food is way above average; you just need to know what to order. The seafood is fresh and well executed. Will definitely return and try the other items on the menu. Lastly, I hope you can always be your Mama’s Boy or Mama’s Little Girl but remember to always be your own person. Don’t ever take your mother for granted. Relationships need to be work on. Bloodlines do not guarantee a meaningful relationship. I hope you all find your own refuge and have the courage to be one for someone else. Happy Mother’s Day! Posted on May 10, 2015 May 10, 2015 Categories American, Cuisines, Fairfield, New York MetroTags Mama's Boy restaurant South Norwalk CT, Mama's Boy South Norwalk CT, Mama's Boy Southern Food, South Norwalk, South Norwalk CT, Southern food CTLeave a comment on Mama’s Boy in South Norwalk, CT – Happy Mother’s Day! Find Your Own Refuge and Be One for Someone Else.